According to the September 18 update at the Centers for Disease Control website, over 3000 cases of West Nile virus (WNV) disease in humans have been reported in the US this year. Approximately half of these cases were classified as neuroinvasive disease (meningitis, encephalitis), and 134 infected individuals have died. West Nile virus (Flaviviridae) was introduced into the Western Hemisphere in 1999, and has spread throughout the Americas, usually transmitted between birds and Culex mosquitoes. American Robins (Turdus migratorius) are considered to be the primary avian vector for WNV, but many other bird species suffer from the infection. Crows and jays are particularly sensitive, and often die from WNV disease; I haven’t seen a Scrub Jay or Blue Jay – birds that usually dominate the squabble for seeds, suet, and nuts – at my backyard feeders for months. Nor are Culex the only mosquito species that carry WNV: the CDC website lists 64 mosquito species, across several different genera, which have tested positive for WNV since 1999. While dogs and cats (and, indeed, 80% of humans) that test positive for WNV typically show no signs of illness, the virus can cause encephalitis and death in horses. My two Thoroughbreds are vaccinated twice each year to protect against WNV viremia (which begs the question of why there is no vaccine for humans). While the warmer temperatures across the US may contribute to the migration of vectors for Lyme disease and Hantavirus , the relationship between climate change and the spread of WNV is less clear. Although the virus originated in Uganda, the first US reports of the disease were not in subtropical Florida, but rather in New York, where the environment favors both mosquito and avian hosts for WNV. 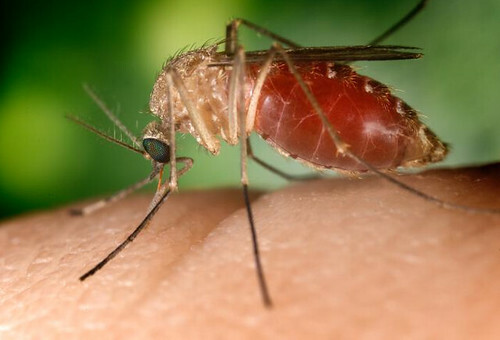 In 2008, Kilpatrick and colleagues examined the effects of temperature on WNV transmission in Culex pipiens, by performing plaque assays on salivary secretions from the mouthparts, as well as on the bodies and legs, of mosquitoes that had been maintained at different temperatures, following a virus-laced blood meal. Based on their results, the researchers predicted that the transmission of a particular virus genotype, WN02, would be accelerated with global warming. Kilpatrick doesn’t attribute the recent WNV disease outbreak in North Texas to climate change alone, however; other factors, such as droughts that kill predators of mosquito larvae, rainfall patterns, and human behavior, may influence WNV transmission. In response to the 2012 WNV disease outbreak, the city of Dallas opted for aerial spraying of the mosquito-control product Duet at low volumes, from aircraft flying at heights of around 300 feet. The product fact sheet indicates that Duet is a mosquito adulticide composed of two pyrethroids (synthetic plant pyrethrins), sumithrin and prallethrin, combined with the synergistic compound piperonyl butoxide. When cautioned to stay indoors, and to bring pets, the rare child who actually plays outdoors these days, and line-dried clothing inside during aerial spraying, citizens are understandably concerned about possible toxicity of the pesticide treatment, and a petition to stop the spraying in Dallas has been posted at Change.org. Opponents point out that the neighboring city of Fort Worth eschews pyrethroid spraying, and instead favors public education about eliminating standing water, using Bt (Bacillus thuringiensis) dunks, introducing fish that eat mosquito larvae, and reducing exposure to mosquitoes. Here in San Antonio, city workers are treating stagnant pools of water with larvicides, and citizens are advised to apply insect repellent and to wear clothing that covers legs and arms when working outdoors. I’m allergic to DEET (N,N-diethyl-meta-toluamide), and moderately sensitive to pyrethrins, so my choices for personal insect repellents are somewhat limited. I’ve been field-testing several alternatives, and I’m happy to share the results with anyone who’s interested. This autumn marks the 50th anniversary of the publication of Rachel Carson’s seminal environmental book Silent Spring, and for all we fret about pyrethroids, DEET, and whatever the hell city workers here are spraying into puddles, direct exposures to some of the most toxic pesticides have decreased since the 1960s. I regret to recall running behind the “Foggy Man” truck as a young child, with the other neighborhood kids, all of us dancing around in a cloud of DDT. 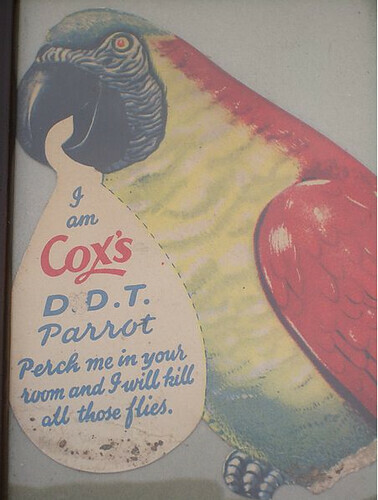 Bird-killing, eggshell-weakening, environmentally-persistent DDT, which was banned for agricultural use in the US in the early 1970s. The ban on DDT use in agriculture was extended worldwide by 2001 Stockholm Convention on Persistent Organic Pollutants. Contrary to the continuing smear campaign that blames Rachel Carson and other environmentalists for “millions of deaths in Africa”, public health applications of DDT for malaria vector control are allowed by the Convention, with support to aid the transition to less toxic and more effective insecticides. To celebrate the anniversary and a reread of Silent Spring, I’ll post a series of my art journal pages on the topics of pesticides and the environment over the next few weeks. This entry was posted in urban public health and tagged DDT, disease vector, pesticides, Rachel_Carson, Silent_Spring, West_Nile_virus. Bookmark the permalink. Hm, I thought I left a comment before, but maybe not. I’m off to Thailand on Sunday, where my concern is more with Dengue Fever than WNV of course. But I’m not so very concerned about that particular virus – although someone told me today that it has been confirmed in the U.S. recently? Apologies for the dissipation of my blog host duties and etiquette – gross anatomy teaching and preparing for study section intervened. Yes, I also read somewhere that dengue fever had been confirmed in the US, in Florida, I think it was. It’s still warm here in South Texas, and we’ve had only one day of fall-like weather, so the mosquitos continue to abound. I’m not sure whether there’s been a decline in WNV cases over the last month, or if the CDC and FDA are instead distracted by the fungal meningitis cases. Yikes! Looking forward to the artistic posts again, Kristi. I can hardly imagine not seeing jays at one’s feeder, though. We have lovely jays over here, slightly rarer, but just as raucous and pretty : the oak jay (http://www.oiseaux.net/photos/vincent.palomares/geai.des.chenes.2.html). I love the Eurasian Jays too, Heather – I remember seeing them while riding in Epping Forest. I’ve yet to see any sort of jay at my feeders this late summer/fall, unfortunately. I hope to get a brief artistic post up this morning, before leaving for study section. Really? There’s a vaccine for horses but not for humans? That does seem a bit strange. I’m not an immunologist (IANAI? ), so I don’t understand why there’s an equine vaccine, and not a human one. I do know that equine physiology is bizarre in many ways, so perhaps the immune system is just one facet of that.